Tony Daysog at Tuesday night’s meeting. Alameda’s rent control initiative now has a roommate on the November ballot after the city council voted unanimously Tuesday night to place a version of its recently passed rent stabilization ordinance on the November 8 ballot. The council’s measure joins the already qualified initiative backed by the Alameda Renters Coalition. The council’s decision comes a day after the Alameda County Registrar of Voters announced a third proposed measure—this one backed by Island landlords aiming to ban rent control—had failed to produce enough valid signatures during random sample check. A further examination of the entire batch of signatures will take another 30 days, said the county registrar’s office, making the measure’s inclusion in this year’s election unlikely. 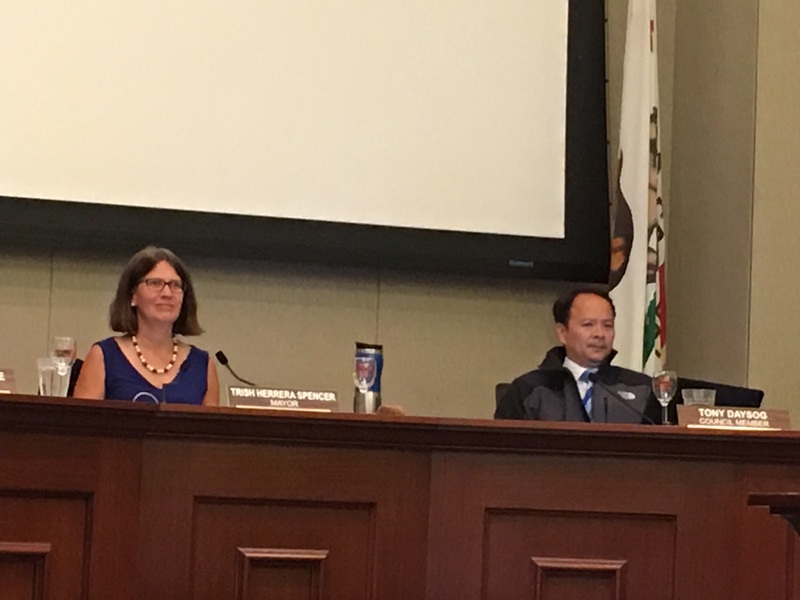 Before the council’s vote to place the existing rent ordinance on the ballot, all five members voice support for its perceived accomplishments since they passed it in March. Councilmember Tony Daysog equated the ordinance to the fairy tale Goldilocks and the Three Bears. “Not too hot, not too cold, but just right,” said Daysog. Perhaps the strongest support for putting the city council’s rent ordinance on the ballot came from Councilmember Jim Oddie. “The ballot box will decide,” he said. “I don’t see the harm in having that debate.” He added that the rent ordinance has already reduced the number of large rent increases in the city, a problem that initially brought the rent-hike issue to the forefront in Alameda last fall. “We pretty much calmed the market for at least a year,” said Oddie. Councilmember Frank Matarrese also voiced support for the council’s rent ordinance, even though he was the lone no vote against its passage four months ago. He also railed against rent control in general, saying such restrictions are expensive to administer and the concept does not limit rent increases or create housing stock. Posted in Alameda, Alameda City Council, Alameda Renters Coalition, Catherine Pauling, Eric Strimling, Frank Matarrese, Jim Oddie, landlords, November election, rent control, rents, Tony Daysog. Bookmark the permalink.